It is so easy at Christmas to get obsessed with food. But it also has a fabulous cultural heritage which really makes the season special. This time of year has some of the most wonderful music, and one of my favourites if the Dance of the Sugar Plum Fairy from Tchaikovsky’s Nutcracker Suite. It’s light, sparkling music that makes you think of flickering candles and glittering frost. It’s also a special, secret sort of music, very careful and measured, not in a hurry – lending itself to the idea of magical things happening when no-one is looking. That hint of sneaking downstairs to look at presents when everyone else is asleep. While we all know the melody, one question remains: what exactly are sugar plums? I have to admit, even here in jolly old Britain where we usually go crazy for just about any twee Victorian treat at this time of the year, they are not very common these days. I had a look in town, and while they could be found in the food hall of Fortnum & Mason (or online here) you don’t really see them anywhere else. Now…just compare that to the ubiquity of the mincemeat pie or mulled wine! I find this quite puzzling. And the reason I find it puzzling is because the idea of the sugar plum is actually still very much a part of Christmas folklore, at least in the English speaking world – in the famous poem The Night Before Christmas the children are asleep “…while visions of sugar-plums danced in their heads…” and of course we know of the fairy and her famous dance. So does this mean that sugar plums are destined to be something that lives on only in stories and turns of phrase? Well, a little more sleuthing also revealed something else to me – there are, in fact, two candidates masquerading for the title of sugar plums! First, there are whole plums that have been preserved in syrup, dried and coated in layers and layers of crysallised sugar. A very time-consuming method which sounds just like the sort of thing people might prepare as a special festive treat. The other is a mixture of chopped fruit and nuts, mixed with citrus zest and spices, rolled together into “plums”. This might sound like a healthy Christmas alternative to the richness of chocolates and cream puddings, but we should not just think with our modern minds. What would this have meant to people but 150 years ago? Dates, prunes, apricots, almonds, exotic spices, oranges – this was the stuff of sheer luxury, that would suggest the flavours of the Orient and other far away lands. In context, this latter version starts to sound like the more luxurious treat. So, faced with this choice, which one should I make? Well, lacking of a jar of plums in syrup made the first option rather difficult, and I quite liked the idea of the nutty, fruity version. My sleuthing also suggested to me that the version commonly referred to in poems is the fruit-nut confection, and therefore I will pay homage to that version. Sugar plums are actually ridiculously easy to make. You just need some honey, spices, citrus zest and dried fruit. Work out what you want in there, chop things up finely, and start mixing. You can use pretty much anything – I used toasted almonds, but you could go for walnuts, hazelnuts or pistachios. For the fruit, I plumped for juicy dates, prunes and apricots, but you can also add dried figs (whose seeds add a lovely “pop”), dried cherries, cranberries, sultanas, candied peel or preserved ginger. And the spice is up to you – I like the traditional cinnamon and allspice, but you could add cardamom, mace, ginger, aniseed, fennel or coriander. The honey can also be replaced by whatever type of syrup you like. All up to you! But once you’ve chopped and stirred, that’s it – no baking, and nothing more elaborate is needed to finish them off than to roll the mixture into balls and covering in icing sugar for a snowy look, or with caster sugar for a sparkling frosty appearance. For all my gushing about how decadent, luxurious and delicious these sugar plums are, it’s also worth recognising that at this time of year, these “plums” actually make quite a welcome change from the heavy, buttery dishes we all get served. In fact, they are not a million miles away from those energy balls that have started to appear in health food stores. Surprising? Well, not really, when you think what they are made from – nuts, dried fruit, honey and spices. However, I’ll be bold, stick my neck out, and suggest that mine might, just might, be a little bit nicer. Maybe even enough to tempt the fairy to take a little break and indulge herself. It is nearly Christmas, after all! Put the honey, orange zest and spices in a bowl and mix well. Add the chopped dates, nuts, prunes and apricots and mix well. If the mixture is too wet, add more almonds. If too dry, add extra honey or chopped fruit (if the fruit is moist). Break off pieces of the dough and form into balls between your hands. The easiest way is to do this roughly first, then wash your hands, and while your hands are damp, re-roll the balls so you end up with perfect spheres. Dust the sugar plums very lightly with icing sugar. Store in an airtight container, and re-dust just before serving. Worth making? These are bursting with the flavours of winter – sweet, rich, nutty, spicy and citrussy. 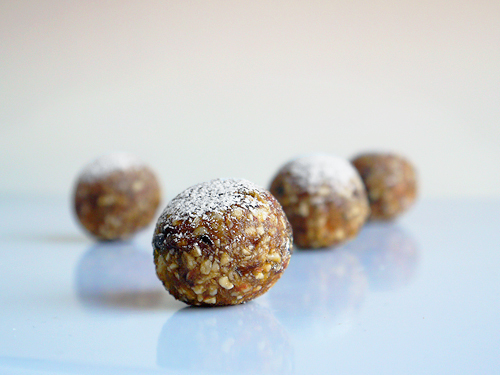 I’ll definitely make these again, using them as…eh…a healthy treat. Festive energy balls, you might say.